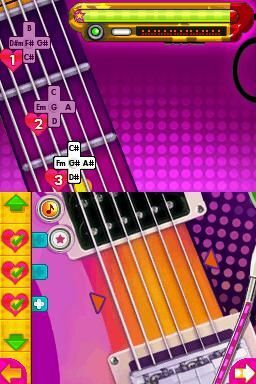 We’re not supposed to be nodding our heads and tapping our feet whilst a cartridge of Hannah Montana: Music Jam is nestled in our DS. At the same time that we’re strumming guitars, playing slap bass, blasting out drum beats and wailing through blues solos; the vacant, dead-doll-eyes of Hannah Montana watch us from the game box’s cover, and her gleaming white-toothed open-mouthed smile appears to be emitting derisive laughter at our shame. Description It's too bad that a fairly awesome music making game is hidden inside a package no self-respecting music-minded gamer would buy.